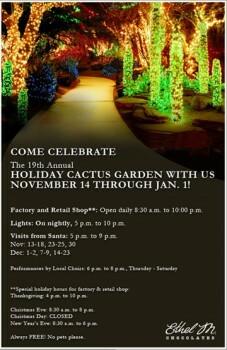 Henderson chocolatier, Ethel M Chocolates, will once again light up the night Nov. 14 – Jan. 1 with the 19th Annual Holiday Cactus Garden. The much-anticipated seasonal attraction will feature more than 600,000 sparkling lights decoratively displayed throughout a sprawling 3-acre Botanical Cactus Garden. In addition to twinkling lights as far as the eye can see, the holiday hot spot boasts live entertainment (Fri. – Sat. ), photos with Santa (Fri. – Sun.) and other festive décor. Making a comeback, visitors can look forward to a display of “meteor lights” that when seen through 3D glasses look like falling snow flakes (glasses are sold for $3 in retail shop). The winter wonderland will illuminate nightly from 5 p.m. – 10 p.m. The glistening garden sits adjacent to the Ethel M Chocolate Factory where guests are welcome to take a self-guided tour and see their favorite Ethel M products being made. As a final sweet stop, guests may sample Ethel M favorites at the tour’s conclusion. The tour aisle and retail shop will remain open for extended hours throughout the holiday season. This attraction is open seven days a week and is always free and open to the public of all ages. 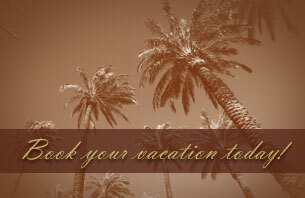 Ethel M Chocolates is located in Henderson, NV at 2 Cactus Garden Drive. For more information, visit Ethel M visit on Facebook. I need th exact address please. Thank you. This chocolate factory experience is as amazing as the chocolates themselves. One thing which I was happy about was walking through the M & M part of the factory and all the gifts available for the people back home. Oh yeah! Everything is also gift boxed. Great place for the kids (of all ages).